To commission an original mural, sculpted mural fragment or folding mural screen, arrangement must be made with the director@artfordesign.com by email or by telephone. For mural commissions outside of the San Francisco Bay Area, commissioning clients will be charged for travel expenses for George Shadow prior to and separate from any accepted commissions. The black and white image (right) is an example of a 9" x 12" graphite on paper sketch that was approved by the client. 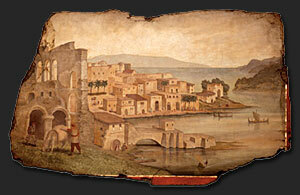 The color image (below) is the completed sculpted mural fragment with 23K gold leaf. The sculpting and the painting required 3 months to bring to completion including time allowed for curing process prior to shipping.